City Councilmember James Zander resigned his seat at the June 20, 2017 DeSoto City Council Meeting. 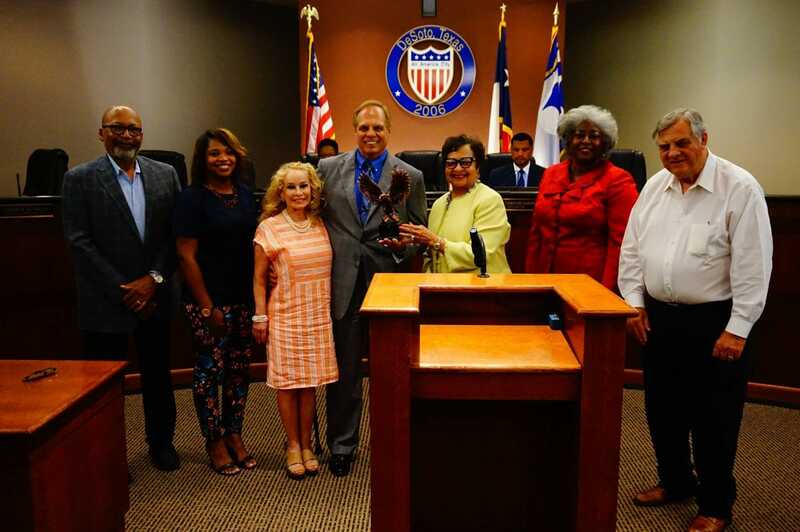 Mayor McCowan and his fellow council members presented him with a golden eagle in recognition of his years of public service to the citizens of DeSoto. DESOTO — He had been on the DeSoto City Council for the past seven years. Prior to that post he served four years on the DeSoto Economic Development Corporation Board. After 11 years of civic service, James Zander resigned from his post. Zander served on the City Council in Places Six and Seven for over two terms. 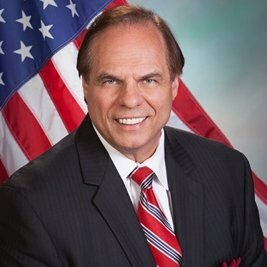 A Special Election will be held on August 26, 2017 to fill the remainder of his Place 7 term. Zander’s resignation from the DeSoto City Council was effective on June 20, 2017. “I am very proud of what has been accomplished in these past 11 years. From significantly lowering the unemployment rate by creating thousands of jobs for DeSoto residents, to the significant expansion of business in the Eagle Point Industrial Park,” says Zander. He also notes the beautification of the City of DeSoto during his tenure, as well as how the councils he sat on dramatically improved city finances over the years. At the June 20 city council meeting, James and Linda Zander were honored for their service the city. “You know this is the first time I have had to do something like this,” DeSoto Mayor Curtistene McCowan said, making certain to call Linda Zander to the podium for recognition as well. She extolled the great working relationship between the city and Zander and his wife. DeSoto residents who are interested in filing for this council seat must live within district seven to be eligible. All registered voters in DeSoto can vote in this special election as candidates are elected at large. Candidate Filing Information Packets can be requested by sending an email to the City Secretary at kmorris@desototexas.gov. Please include your name, address, email address and contact phone number. Packets can also be picked up in the City Secretary’s office during regular business hours. The City Secretary will accept completed candidate filings for a place on the ballot Monday through Friday between the hours of 9 a.m. and noon and from 1 to 4 p.m. through July 17, 2017. On that day, the City Secretary’s office will close promptly at 5 p.m. and no filings will be accepted after that time. Early voting for the special election begins on August 9, 2017 and continues through August 22, 2017 at Disciple Central Community Church. Voting on Election Day, August 26, 2017, will take place at the Belt Line Conference Center located at 200 E. Belt Line Road.